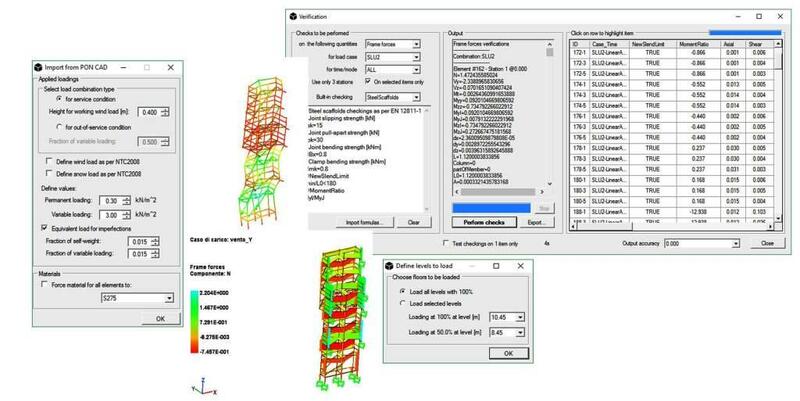 NextFEM is proud to present NextFEM Struct, an innovative solution for analysis and checking of scaffolding and stages. Developed in partnership with MEC CAD, the PON CAD module offers an easy-to-use interface with PON CAD (R) design products, that have a long-standing experience in helping professionals to design scaffolds, stages and much more. NextFEM Struct is a one-click solution: you can import the structure developed in PON CAD and be ready to analyse and check it in seconds! generation of the analysis report in RTF format, including automatically generated screenshots. Italian Ministry of Infrastructures, D.M. 14-01-2008 (in the following, NTC2008) and Annex no. 617, 02/02/2009. PON CAD module is distributed by MEC CAD as NextFEM Struct.